A voice doesn't always have to be verbal. It can be a sense, a mood or a thought, but in Destiny 2: Forsaken, your audible voice is more important than ever. 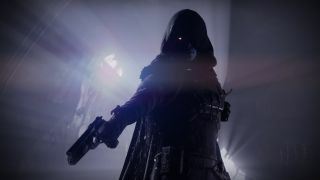 After playing as a mute protagonist for the entirety of Destiny 2 to date, Bungie is choosing Forsaken's story as the pivotal moment to give your Guardian their voice back. I found that the original Destiny didn't exactly portray your Guardian in a manner that was befitting to their universe-saving grandeur. Weird quips, dodgy lines and a general oddness to the voice acting meant that it never felt like your Guardian's dialogue represented how you felt playing through the story missions, and beyond. So for the entirety of Destiny 2 to date, your Guardian has been a mute protagonist, standing silent despite the odds, and despite the monologuing from members of the Vanguard, and characters like Osiris. Until now that is, and you find your voice in the most fitting way possible - probably when you're sat inches from the screen with emotion in the moments after Cayde's death, just as I was. As our old pal lies there, his ghost dead, and a huge hole in his chest, you have nothing to say, despite his attempts at a few last jokes. "Speechless, typical," he says, clearly suffering. Goddamnit Guardian, do you have nothing? Well, hold your horses folks, because it's coming. The moment we've all been waiting for. As Cayde's body lies under a silken cloth, Ikora Rey is pledging vengeance, but Zavala is having none of it. The pair won't be going after Uldren it seems, but we are. "I refuse to bury any more friends," says Zavala. "You won't have to," speaks your Guardian. "Uldren Sov is mine." Hearing your Guardian speak after a year of silence is a powerful thing. It taps into a connectivity between player and game that I haven't felt with Destiny 2 since launch, and who knew it would only take a line of dialogue. Well, of course, it's not just that line of dialogue though (RIP Cayde). It's the overall feel of what Bungie is delivering with the story. In that sense, the title of Forsaken is an interesting choice of words.It means abandoned, or deserted, and it represents the tone of this second year of Destiny 2 in more ways than one. It's about your Guardian, deserted by the Vanguard following Cayde's death. It's about your quest for revenge, and the sadness over the loss of a mentor that hangs like a shroud over every subsequent mission after that opening. But it's also an indicator of what the community has felt over the past year since Destiny 2's launch. It's clear Bungie knows that there's a lot riding on Forsaken, but from what I've played so far, you won't be left feeling abandoned for long. There's a new emotion here, because I'm coming at Forsaken with a renewed passion, and an anger. Not one directed at the game's creators, but at these new and returning foes. Not since House of Wolves have we had such a grounded antagonist, and although the Barons might play out like a brilliant Marvel-esque ramshackle, it's Uldren who provides the real intrigue. He's an Awoken, just like my Guardian, and underneath the story of revenge and wonderful Destiny grandiosity, he's just a man dealing with grief. By giving your Guardian a voice, and making a protagonist you can almost empathise with - he killed Cayde, he's not getting a free pass - I feel more connected to the story than ever before. It helps that, along with a voice, Bungie is also giving you the power to choose your own destiny (pun absolutely intended). After a few missions the story breaks out and lets you choose which Baron to go after first. So far I've only taken on the Rider, a cackling she-devil on a custom Pike, but each one has their own story that you can discover through the new lore drops that you'll find in the Triumphs menu. These new World of Warcraft-esque achievement systems are themed around plenty of gameplay cores, but there's a section specifically for lore that'll help pad out the 20+ hours of story content on offer with Forsaken. But the more important thing is, it's totally up to you what order you do the Forsaken story content in. And have I mentioned just how good it feels to play? Forsaken is the perfect reminder that Destiny really does offer some of the best gunplay around, and with a plethora of new weapons to discover, it's wonderfully refreshing to come back to Destiny 2 after some time away. Even the new enemies, the Scorn, really mix things up. They move around the battlespace like blue smoke, dissolving before your very eyes and relocating somewhere even more inconvenient. They're quick, smart and offer much more variation and challenge than anything we've seen from Destiny's enemy AI to date. Bungie is ticking all the right boxes. From what I've played so far, Destiny 2: Forsaken's story is playing into exactly what the community wants. Narrative, and powerful narrative at that. It might be strange for Bungie to lead on the narrative in its push for Forsaken, particularly for a game that's all about the longevity, but it's already clear that this is an expansion that's about to change Destiny 2's fate.